In case it has slipped your attention there is a general election on its way in a matter of weeks and that means two things; more televised live debates and Ladbrokes customers being able to profit from the politicians squabbling for attention. Last time the podiums were rolled out for the TV cameras as all seven main party leaders took part, we said ‘Rubbish’ would inevitably be talked. Pats on backs all round for those who jumped on at 2/1. Now the Challengers Debate is upon us five of the same protagonists, minus Prime Minister David Cameron and his deputy Nick Clegg, will slog it out in front of the electorate again. In the last leaders debate it was widely taken that SNP chief Nicola Sturgeon and Ukip frontman Nigel Farage scored the most political points and along with Labour’s Ed Miliband aka the ‘Happy Warrior’ the pair are sure to feature prominently. It’s 3/1 that the phrase ‘Happy Warrior’ is heard, in reference to some motivational notes discovered in Miliband’s dressing room after the last debate, supposedly in relation to the persona he wished to exert. Snigger. With Farage performing hot on the heels of Ukip’s election manifesto being released, the MEP is sure to be taking the opportunity to voice his forthright feelings on his main beefs; the EU, immigration and Britain’s spending on Foreign Aid. 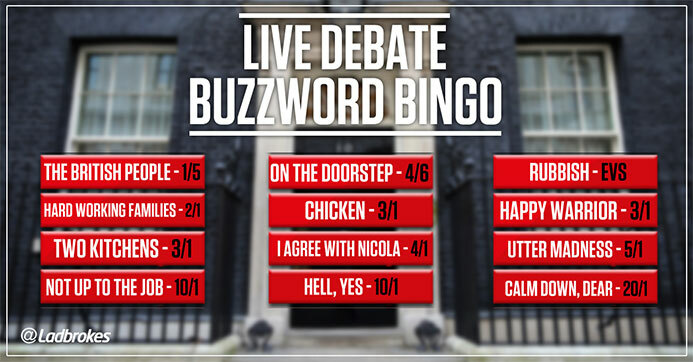 When speaking in the build up to this debate Farage labelled the government’s budget on the latter point as ‘Utter Madness’ given the size of the national debt and a repeat of that phrase looks a belter at 5/1. Similarly, with Sturgeon fighting Labour for so mamy seats north of the border, don’t be at all surprised if ‘Labour’s Economic Mess’ gets dragged out once again, in reference to the state of the nation’s finances after the global crash. The trio of evens-money shots also look particularly ripe too, not least ‘Scaremongering’.